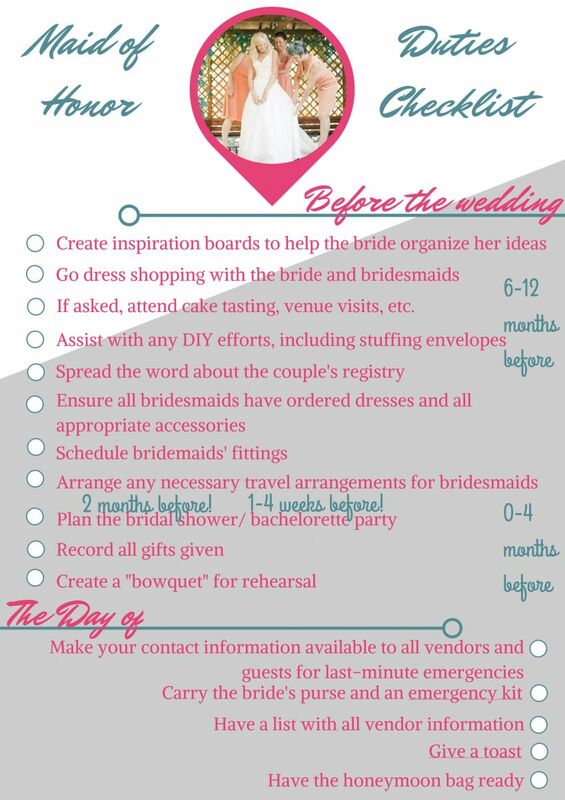 Use this handy maid of honor checklist to make sure you've successfully completed all your duties before the big day. So, you're the MOH; what a compliment! Being named the right-hand woman is quite a testament to your character. You are organized, loyal, and reliable enough for the bride to trust you as her voice of reason. She will, no doubt, turn to you in happy moments and in sad, and it's your job to know how to handle it all, so we’ve compiled this list of maid of honor duties! Chances are you know your bride inside and out, so you'll know best when to chime in and when to hold back, but she will definitely be looking to you for opinions, support, and stress control. She'll also trust that you know exactly what your maid of honor duties are. Pretend you do, and then consult this amazing guide to keep everything under control. Here you'll find all of your tasks laid out like the perfect maid of honor planner so that it will bring you to the big day with a sound mind. Keep in mind that being the maid of honor can get a bit costly. You are expected to help fund the bridal shower and the bachelorette party, give gifts for the shower and the wedding and pay for your entire ensemble. As long as you have clear expectations of what is expected of you in advance, being a MOH is a truly rewarding experience. You will be helping your friend enjoy one of the most important days of her life and that is an irreplaceable experience. Embrace your duties and be a rock for the bride during the wedding planning process. With the help of this maid of honor planner, you will have all the need-to-know information at your fingertips. Thanks to this free printable maid of honor checklist, you can make sure you nail all of your duties without all the stress. Click here to download this free PDF! Be accessible; no matter how many times the bride calls you in tears about the napkins, listen and console her. Try to come up with solutions to fix the issue; you want to make her wedding as stress-free as possible. This is possibly the most important of your maid of honor duties. Create inspiration boards for the bride. Attend any meetings the bride requests; cake tasting, florist, catering etc. Go dress shopping with the bride. Go dress shopping with the bridesmaids. Spread the news of the couple's registry. Make your contact information accessible for out-of-town guests for any last-minute emergencies. Many forget that their maid of honor duties consist of helping the bride with guests. Keep track of the bridesmaids throughout the entire planning process and on the day of; make sure they have their dresses, shoes, and jewelry on time and know where to be for all events. Help address envelopes, pack favors etc. Plan a bridal shower about two months before the wedding (see next section). Record all gifts given at the bridal shower. Collect the bows from the gifts to make a "bowquet" for the rehearsal. Throw a bachelorette party. This is another very important part of your maid of honor duties! Never planned a bridal shower before? No worries - just use this handy printable bridal shower checklist to make sure that you cover all the bases. Click here to download this free PDF! Handle any last-minute crises; make sure that these all go through you, not the bride! Have an emergency kit containing bobby pins, acetaminophen, lotion, tissues, a copy of her vows, mints, stain remover, mascara, face wipes, oil blotters, lipstick, fabric tape, antacids, floss, and deodorant. Make sure all bridesmaids are at the venue and made up correctly on time. Wrangle up the bridal party and make sure everyone is where they need to be before the ceremony begins, this includes the flower girl and ring bearer. Bustle the bride's train once she is situated. Hold the groom's ring during the ceremony. Hold the bride's bouquet during the ceremony. Sign the marriage license as a witness. Stand in the receiving line, if the bride requests. Direct guests as needed and collect any cards or gifts that aren't placed on the gift table. Enter the reception hall with the rest of the bridal party. Give a toast (see below). Dance and encourage others to do so! Make sure the bride eats and has a good time. Help the bride change out of her dress, and have her honeymoon bag ready. One of the most nerve-wracking tasks on your list of maid of honor duties is the big speech. Learn how to write the perfect maid of honor speech that will wow the crowd! Now that you’ve gone through this maid of honor checklist, you’ll want to learn how the tradition of having a maid of honor got started. In the United Kingdom, the maid of honor was actually the female attendant to the queen, not her closest or special girlfriend as they are known to be today. In fact, if the queen’s head attendant was married, she’d be referred to as the matron of honor rather than a maid. Maids of Honor were usually meant to help out with parts of the wedding the bride was unable to handle just as they are known to do today. However, the duties were much more strenuous under the queen as a bride, who was not expected to do any of the work or planning for herself. If you’re looking at these tips and finding all the work overwhelming, just remember that you could be a servant to the queen! Did we forget to include any maid of honor duties? Let us know in the comments section below! I need to give this to my best friend who is going to be my maid of honor. She just asked me last week what her duties were, other than keeping me from running away. She can read thru this and make her self some notes to follow. Thank you for sharing.